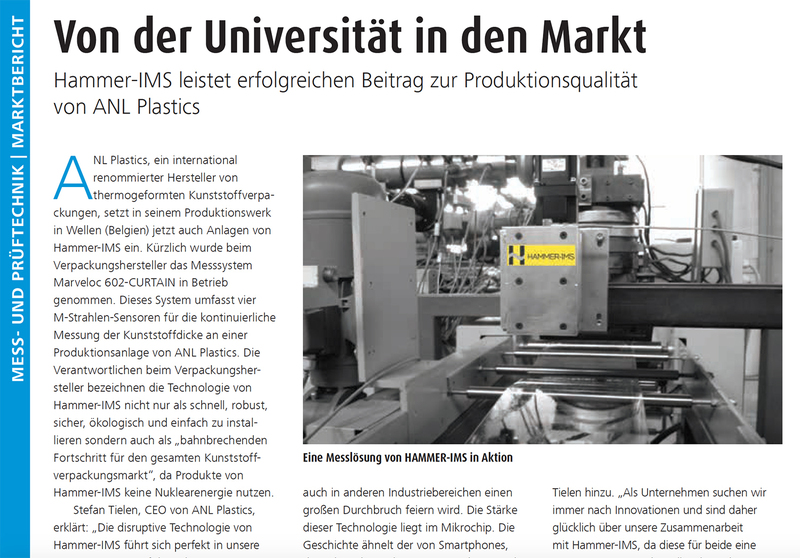 The industry-leading German magazine C2 featured the application story of Hammer-IMS successfully contributing to the production quality at ANL Plastics. The international producer of thermoformed plastic packaging – uses a Marveloc 602-CURTAIN measurement system from Hammer-IMS in its production facilities in Wellen, Belgium. The system contains four M-Ray sensors, continuously measuring the plastic thickness on an ANL Plastics production machine. ANL Plastics experiences the technology of Hammer-IMS as fast, robust, secure, ecologic and easy-to-install. Stefan Tielen, CEO ANL Plastics: "The disruptive technology of Hammer-IMS fits our strategy to play a leading role in downscaling the widespread use of X-ray and nuclear measuring systems in our sector.